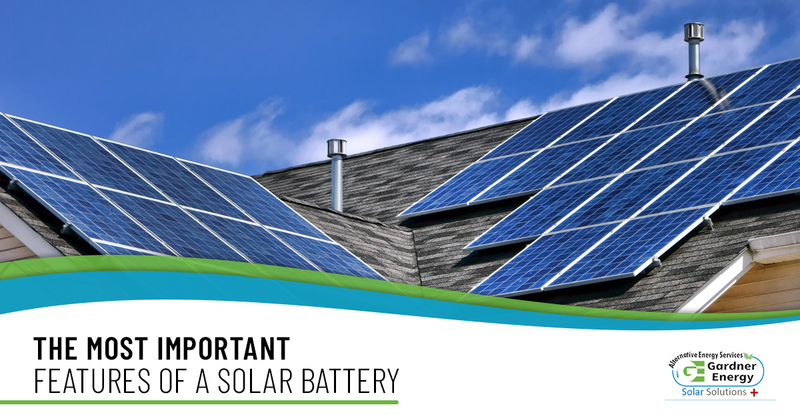 If you’ve kept track of our blog, you’ll know that there are a few different kinds of solar batteries available to use in your home or business. While, ultimately they all do the same thing, they do it through different means. When determining which battery will serve your home the best, you’ll want to keep a few features in mind. Different batteries have different capacities (how much electric energy it can store). The storage capacity of a battery is measured in kilowatt-hours. To get enough storage capacity for your home, you’ll want to find a battery that can store more than your daily electric usage. You’ll also want to consider how many days worth of electric energy you want to store in your battery at a time. For those looking to go off the grid, it’s advisable to find a larger battery. For those who want to stay on the grid, you might get by with a smaller battery. In addition to capacity, keep the battery’s power rating in mind. This is how much energy your battery can expel when you need it. You’ll want to find a battery that has the right balance of capacity and power rating for your needs, as batteries with high power ratings often have lower capacities and vice versa. While your battery stores energy for your home, it also has to store a certain amount of energy to sustain the operation of the battery itself. This balance between usable and unusable energy is the battery’s Depth of Discharge. The DoD of the battery will vary between brands, models, and even types of solar battery. In general, the higher the battery’s DoD, the more energy within the battery you can use to power your home. Consider the following example. If you install a 15 kWh battery that has a depth of discharge of 90 percent, that means you can use 13.5 kWh of energy before you have to recharge it. Should you use more than 90 percent, you might notice a decline in the performance of the battery from there on. When comparing batteries of similar size, type, and performance, the deciding factor may come down to the warranty. Every solar battery will be backed by a warranty, but what the warranty covers varies between manufacturers. Commonly, some solar batteries are covered for a given number of charge-discharge cycles. Other common warranties protect a range of years of the battery’s effective lifespan. Still others will include language that protects the overall performance of the battery throughout the time you own it. Looking for a solar panel installation company in Utah? Gardner Energy is here to help! With years of experience and a commitment to high-quality work and products, we can help your home or business go solar! Contact us today and ask about our free quotes!